Iðunn is attested to in the Poetic Edda, the Prose Edda, as well as in archaeological burial finds, in which apples and other symbols of this goddess of immortality have been found. Her name means “rejuvenating one,” “rejuvenator” or “ever-young.” Kennings for her name are about springs or eddys of water, and notions like the fountain of youth may be a reference to her. She is often depicted as a summery maiden goddess adorned with flower blossoms, bearing fruit, and tending her gardens. She is the wife of Bragi, the god of poetry and music, and the sister of Nanna, the goddess of joy. Similar in spirit to her sister, Iðunn is the goddess of youth, newness, renewal and vitality. She is described in the lore as being highly regarded, and her apples are the food of the gods – because of them, the Ásgardians remain youthful and strong. She carries them about in an eski (wooden box) made of ash, and connected to Yggdrasil. Iðunn seems to have exclusive access to these apples. Not surprisingly, she is one of the Ásynjur, or greater goddesses of the pantheon. Like Freya, she is described as golden, and is coveted by the giants, who routinely barter with the Æsir, demanding her for a bride. Surprisingly, it is Iðunn, and not her apples, that the giants seem to want. The best known illustration of this is the story of how the jötunn Þjazi kidnaps her – one of the most dangerous misfortunes to have befallen the gods! It should be no surprise that Loki was at the centre of this fiasco. The scheming god tricks Iðunn into venturing out beyond the gates of Ásgard, where he has already arranged for Þjazi to be waiting. Þjazi absconds with the goddess and her apples back to his hall Þrymheimr, back in the giant’s land of Jötunheimr. In Iðunn’s absence the gods begin to age and whither. It soon comes out that her disappearance is all Loki’s doing, and they force him to fix the situation. He borrows Freya’s falcon dress and flies to Jötunheimr to steal Iðunn back, sneaking into Þrymheimr. Using magic, he changes her into a nut and carries her back to Ásgard. Not about to lose his prize so easily, Þjazi gives chase in the form of a mighty eagle, and nearly nabs Loki several times before they see the great shield wall of Ásgard before them. The gods build an enormous blazing fire atop the ramparts, through which Loki the falcon skillfully dodges. Much too big and not nearly nimble enough, Þjazi the eagle is caught in the bonfire and perishes at the hands of the gods. Iðunn returns to apple duty, and Þjazi’s vengeful daughter, Skaði, confronts the gods soon after. Iðunn stands out in the Northern pantheon. She is no warrior Valkyrie or sovereign queen. She is depicted as rather ditsy, naive, and a bit “fluffy.” Along with her husband Bragi, she seems to be one of the deities who have light and bubbly personas. Iðunn bears the archetype of the Divine Child. It is an amusing notion that the very godhood of all of Ásgard rests in the hands of the divine damsel, especially with mighty, vital Thor and Óðin striving against the impending Ragnarök. The gentle goddess literally holds the gods’ vitality and strength in her hands. 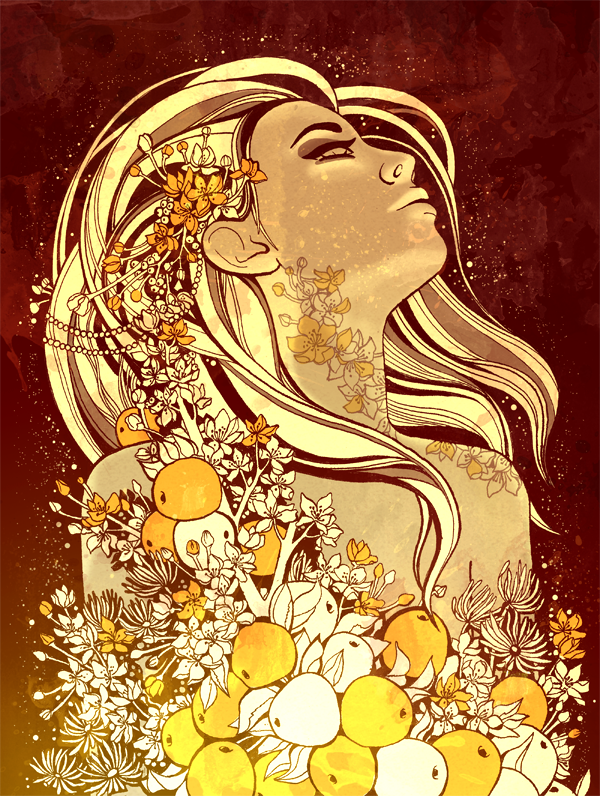 Many Heathen, as well as non-Heathen, scholars perceive that Iðunn is one-and-the-same with the Anglo-Saxon maiden of renewal, Eostre, also known as Ostara in Germany. Eostre is also well-known by the names Eos (Greek) and Aurora (Latin). 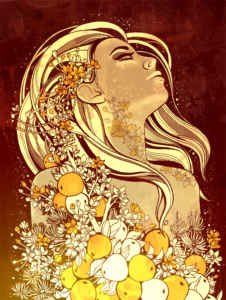 Intriguingly, Iðunn strongly resembles Hebe, the Grecian goddess of youth and daughter of Hera, who dwelt in the garden of the Hesperides, a celestial orchard, west of west, where the golden apples of immortality grew. Hebe served to the gods of Olympus ambrosia, a divine nectar which kept them ever-young. Iðunn may also be related to Nimue, the maiden-enchantress in Malory’s Mort D’Arthur, who dwells on Avalon, “land of apples,” which lies west of west, and where one can regenerate from even mortal wounds. Apples (especially golden), apple cider, orchards, fruit trees, and spring blossoms. Eggs, seeds, and nuts (especially hazelnut). Springs, brooks, streams, and fountains. Spas, pools and saunas. Spring (season) and dawn. Baby animals and baskets. The colours gold, light green and rosy pink. The rune Vend. Idun, Idunn, Ithun, Iduna, Idunna, Edgeona, Eostre, and Ostara.